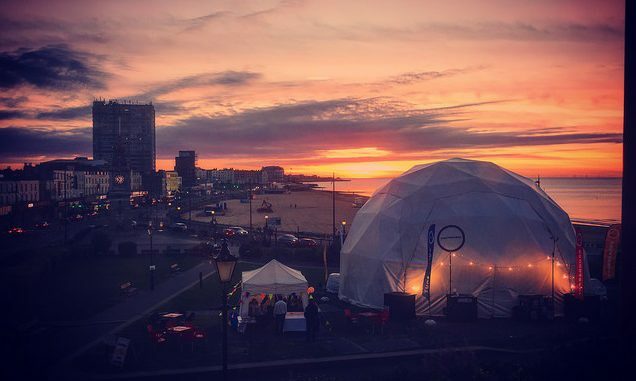 Paines Plough’s pop up theatre, Roundabout, returns to Margate this month after a sell-out run at the Edinburgh festival. The award-winning theatre will pop up on Marine Gardens from Thursday, September 20 to Sunday, September 23. Roundabout features an electric blend of touring and locally produced work. This year Paines Plough bring three new plays: bittersweet coming of age story Island Town by Simon Longman, razor-sharp satire Sticks and Stones by BAFTA nominated writer Vinay Patel and family space adventure How To Spot An Alien by Georgia Christou. Also transferring from the Edinburgh festival is the latest play by award-winning playwright Tom Wells. Drip is a one-man musical comedy about a synchronised swimming team in Hull. Local work includes comedian Charlie Partridge’s new show I Can Make You Feel Good. By Comparison. Dan Thompson, award winning artist and poet, brings his new show Your England featuring 100 poems about 100 places while Karen Bartholomew’s new play Giving Up Marty examines the ups and down of fostering and adoption. Inspiration Inclusive will be sharing the latest work from their adult groups, including the sing and sign choir. Looping The Loop will be sharing new work in their Scratch-A-Round. Throughout the four-day festival there are a number of workshops including acting sessions from the Actors Centre, a taster session for the Theatre Royal’s youth theatre and a chance to explore the themes of new play Hannah and Hanna in Dreamland. Paines Plough artistic directors James Grieve and George Perrin said: “We’re delighted to be returning to Margate with Roundabout for the fifth year. We always have a brilliant time. It’s especially exciting to be part of Margate Festival. We can’t wait to hear what the audiences think of the three new shows. “Once again we’re producing three world premieres in repertory; Island Town is a bittersweet story about friendship, hope and dreams of an escape from George Devine Award Winner Simon Longman. Sticks And Stones is an incisive satire on the modern condition from BAFTA nominated Vinay Patel. Georgia Christou’s How To Spot An Alien is a rip-roaring space odyssey for adventurous young people and older stargazers.